On this date in 1803, Flemish outlaw Ludovicus Baekelandt was guillotined at Bruges with about 20 of his gang. Deserting the army of the conquering French, Baekelandt set up as a bandit preying the deep spruce forests of the Vrijbos, eventually attaining leadership of a gang more than 30 strong. Baekelandt is one of those whom popular memory and national sentiment (resentful here of the French occupation) has elevated into huggable social banditry. But the evidence remaining us testifies to little but a garden-variety brigand whose offenses were in no way confined to property crimes. 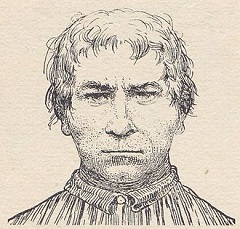 The gang was rounded up in 1802 and the Bruges court heard testimony from more than 100 witnesses, eventually dooming 21 men and three women to death for a litany of murders and robberies. Almost all the information about Baekelandt available online is in Dutch; if that tongue is in your toolkit, gentle reader, this public-domain book is sure to level you up on Ludovicus Baekelandt and friends.